Come in for a visit in our showroom at 4310 S. Shields Ave, Chicago IL 60609 with a layout or just a simple drawing with measurements so that we can quote your project. 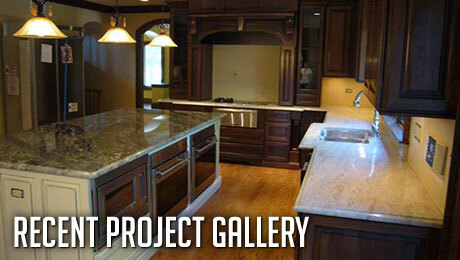 At our showroom, you can see samples for granite, marble, and quartz. We can even show the actual slab that will be use for your project in our backroom if you choose to. We can quote you on the colors you choose to your liking or if you are unsure of your selection, we can offer a quote based on the average price range for stone. Fax over a layout or email with measurements of your project. Please provide us with as much information as you can, regarding your project. This includes: layout and measurements, granite color or group, edge, contact information including the job address and any other details that will help us determine the quote of the job. You can also use our Estimate Form and fax it to (773)373-3330 or e-mail it to (cmstoneworks@sbcglobal.net) . Here you will find an example of kitchen countertop drawing. We strongly suggest that you choose your slab(s) in person. We have a large selection of stones to choose from at our showroom/warehouse. For certain colors that we may not have in stock, we can get it from our local distributors. 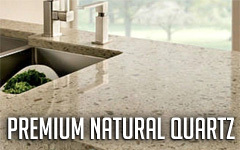 We may provide you with an address of our local granite supplies with whom we have established a relationship with. This will allow you the opportunity to personally see your slab(s) in person. We suggest that before making a final selection on natural stones that you be prepared to accept its earthly beauty along with its natural variance. If you do not see a material you like, you can visit one of our suppliers. You can ask the supplier to reserve a specific slab(s), assuming you find one like, and this will assure that you get exactly what you wanted. Please note, these suppliers will not provide you with material prices, but we will get you the pricing once you made your selection. If the price is agreeable, we will need a deposit so we will contact the supplier to arrange for delivery to our shop. A 50% deposit is required to move forward with the job and along with measurement and templating as necessary. The final price will be calculated based on the actual measurements taken on the jobsite. We will also verify the stone and the edge selected. In order to do a template and the installation, the following are needed to be completed in your home: cabinets need to be installed and leveled. If the customer is providing the sink, the sink needs to be on location so that we may take it back to the shop and use it as a template for the sink cutout. We will give you an exact date when your new countertops will be installed (usually it’s around 5 days after placing a deposit). Also, we will give you a window for the time our crew will arrive on that date. On the day of the installation, we will be able call you to give you a more accurate time of arrival. Schedule a plumber and/or necessary contractor for the next day to completed any other work after the countertop is installed. We will install the countertop, drill the amount of faucet holes you need, and attach the sink. Installation usually takes around 2-4 hours . 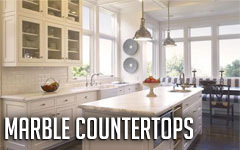 If you have a current countertop on your cabinets, we can remove and dispose the old countertops at an additional cost. Once we finish the job, we will require the remaining balance on the order. Your Contractor or plumber could finish the plumbing and etc. on the next day.